How Will the US Election Outcome Impact Gold and Silver? Metals investors wonder what this presidential election will mean for gold and silver markets. Since Nixon closed the gold window in 1971 and the years of price inflation that followed, presidents have largely ignored gold, the Federal Reserve, and other issues related to sound money. Today, the devaluation of the Federal Reserve Note – the explosion of debt and the eternal deficits which enrich bankers and the political class at the expense of the rest of us – is getting harder to ignore. The looming national bankruptcy coincides with this year’s extraordinarily divisive election. Regardless of which candidate wins, the Washington DC establishment has already lost a great deal of legitimacy. Polls show well over half of the population will not support the victor. As the trust and prestige of our Federal government fades, the potential for social unrest and even wrenching change in governance and policy is on the rise. That represents a wildcard for gold and silver markets which is impossible to predict. We can only say history shows gold and silver as key assets during periods of upheaval. If crisis is coming in the next presidential term, the people holding physical metal will almost certainly be glad they did. We can find very little reason to expect either candidate will fundamentally change the country’s fiscal or monetary outlook. For starters, it’s important not to put too much faith in what any president can do. Congress has final responsibility for spending and debt. No one is seriously predicting a transformation in that “august” body any time soon. You can expect the status quo. The next Congress will remain beholden to the deep state, and unaccountable otherwise. Neither presidential candidate is making any sort of promise to address the basic problems of too much debt and crushing entitlement commitments – Social Security, Medicare, Medicaid, etc. Donald Trump has made a lot of hay campaigning as an agent of change. But he isn’t making any bold promises to dramatically reduce spending and entitlements. He intends to increase military spending as well as infrastructure spending, both of which will invariably increase government debt. He wants Americans to believe he can promote enough economic growth to make these burdens bearable. Is there anyone who still believes this tired old political promise after hearing it repeatedly for all these decades? For anyone who does, we suggest taking a look at the many good arguments about why we’re past the point of no return when it comes to avoiding a debt crisis. One problem (among others) with the notion of growing our way out of the predicament we’re in is that higher rates of growth could be accompanied by much higher interest rates. 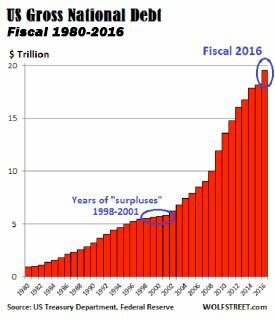 Do the math on what happens to the federal budget when interest rates return to levels closer to what we had in the 90’s. It isn’t pretty. 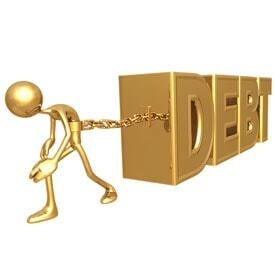 Borrowing costs of 5% translate to an interest expense of a trillion dollars per year. Tax receipts will need to grow enough to wipe out the current deficits, plus cover the additional borrowing expense. Growing our way out of the current mess is impossible. For those who want to still believe the federal debt is manageable if the U.S. can expand GDP, we’d point out strong growth does not necessarily translate to reduced debt. Just look back at the Ronald Reagan years and the Bill Clinton years – both periods known for economic growth. There is a limit somewhere when it comes to the size of the obligations our government can service. Even optimists should admit the U.S. is currently on a one way road to financial ruin. A default is coming – almost certainly via massive devaluation of the dollar. This election is the most fascinating we’ve ever witnessed. But the fundamental drivers behind precious metals go far beyond the office of president. That is why you should expect prices to be dramatically higher 4 years from now, regardless of what happens at the ballot box in three weeks. Previous Article Gold and silver moving up, China taking control?